Incorporating long fluid strokes of varying depth and pressure, your massage therapist will devise a treatment that is as unique as your body to fit your individual needs. As your stress melts away and your mind relaxes, your massage will enhance the body’s natural functioning as well as reduce pain, improve circulation, and enhance immune functioning. Short on time? Choose a 30 minute massage. Looking for a relaxing escape from the stress of daily life? The first part of our body to show signs of aging is our face. Cheat Mother Nature with our Anti-Aging Facial. This specialized treatment is created for skin that’s showing signs of age—sagging, fine lines, and dullness. 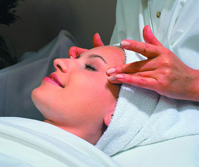 During this break through treatment from Bioelements, your esthetician will perform a thorough cleansing, followed by our exclusive layered exfoliation process, energizing massage and ultra tightening mask. It is all designed to restore firmness to sagging skin as it lifts, tightens, and smoothes. Designed to rid the body of unwanted hair, our full body waxing services are performed by a knowledgeable (licensed)esthetician ready to answer all of your waxing concerns in a private, comfortable setting. Looking for a healthy glow without having to take the time to lay in a tanning bed each day? Look no further. Our airbrush tan technician will help you choose the color that best fits the look you’re trying to achieve. Choose from regular, dark, or double dark solution*. After picking a color that works best with your skin, your technician will spray you with a solution that will maintain the health and radiance of your skin while giving you that just-off-the-beach color. A custom spray tan will give you a thinner, younger appearance without the orange color often associated with spray tanning. Finding the perfect hairstyle is the ultimate goal for everyone; we all would love to have the perfect cut, color, and style. Luckily, here at Salon La te Da, that’s just what you’ll get! Whether you want long, luxurious curls or a short, angled bob, our stylists are trained to do it all. Not sure what you’re looking for? No problem! Your stylist is trained to take into account your face shape, hair texture, and lifestyle and will translate that into the cut and color that’s perfect for you. Rest assured that we use the finest in professional hair color, products, and tools and are constantly continuing our education. Make an appointment for any of our hair services and you will walk away feeling pampered, relaxed, and even more beautiful than when you came in. Whether you’re going out for a night on the town with friends, getting married, or looking to learn the best way to apply your everyday makeup, we can help. After determining the perfect shades for your skin tone, our makeup artists create a look as unique as you. A perfect manicure and pedicure is your best accessory and will never go out of style. 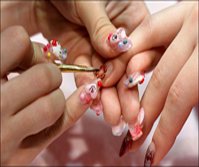 Our nail technicians will pamper your hands and feet leaving them feeling and looking their very best. We carry a wide selection of O.P.I. 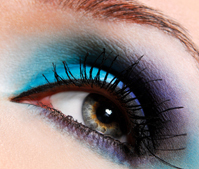 products to choose from, including the newest color collections.